With a year coming to an end we can look back to the great impact we have achieved in 2018. For the fourth time we were able to implement the Day of Caring in Germany where John Deere employees packed bags with groceries for people in need. Starting with one John Deere location a couple of years ago, this year we mobilized 425 employees at 6 locations: Mannheim, Bruchsal, Kaiserslautern, Zweibrücken, Stadtlohn and Gummersbach. Many of them didn’t volunteer for the first time. On the contrary! In many conversations they let us know that not only the Day of Caring had already become a tradition dear to everyone. They would even miss something substantial without it. “I fully support John Deere taking over social responsibility like this! That is why I come to help every year. Community matters, that’s why giving back is crucial. Working for a company that has understood this relation makes me proud”, states a volunteer from Mannheim, a city driven by industry and infrastructural change. These committed volunteers, a hands-on project team at John Deere and the fruitful co-operation with eight non-profit food banks “Die Tafel” made this project a success. 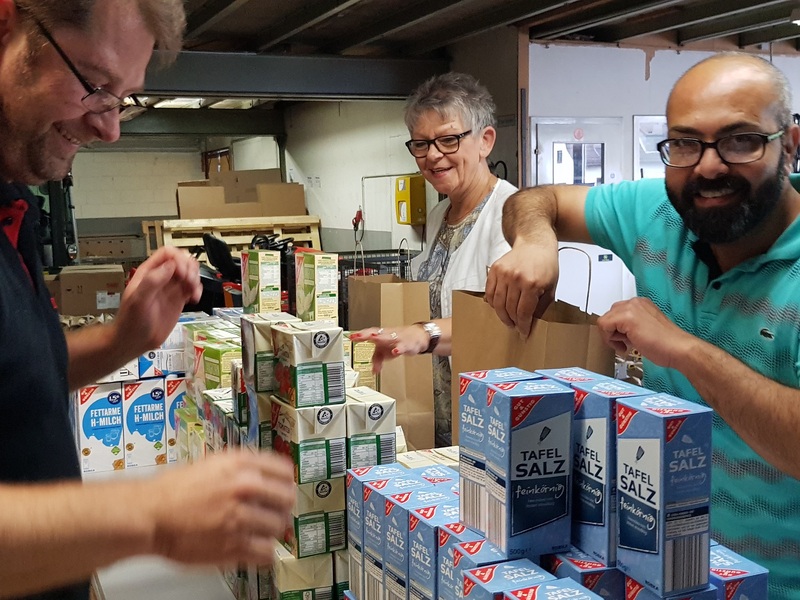 During the Day of Caring “Die Tafel” received 8.200 bags full of lasting groceries in 2018 alone and distributed them among people in need. “Our local customers at ‘Die Tafel’ really appreciate John Deere’s effort. It is touching to watch especially old people receiving the bags and their eyes lighting up when they read one of the handwritten greeting cards that the John Deere employees attached to them. They know this company for all of their life, some of them even since the time before the Second World War. So for them it feels special to receive not only the much-needed groceries, but also the attention of a regionally important company”, Hubert Mitsch from “Die Tafel” in Mannheim explains. The team at PHINEO/ United Way Germany is very grateful for all helping hands and John Deere’s commitment to continue the Day of Caring. We already started preparations for 2019 with some fresh ideas to improve the volunteering program and to help communities foster.